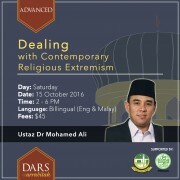 An extension of DARS Beginner, DARS Advanced features asatizahs who are degree and PHD holders who will be discussing topics relating to what it is like living in Singapore as a Malay Muslim community. Tolerance of different opinions in matters of faith has been expounded (discussed in depth) by the Islamic scholar Al-Ghazali, in his observations on society during his time as a means to deal with differences in beliefs to better maintain unity among people. The abundance of information in today's modern age requires strict observation and research of religious texts and the importance of context in accordance with the Sharia. Later in October, DARS will be discussing the causes and consequences of extremism in religion, and whether it escalates into terrorism or other dangers besides terrorism. 1) Full Payment / Deposit are to be made before class starts. 2) No refunds for participants backing out. 3) Participants are to be punctual and inform organisers. 4) You may pass on your ticket to another party if you are unable to attend. Method 1) Payment by Cash / Nets - Please call our HOTLINE @ 6871 8744 Ext 1 to arrange appointment for payments.